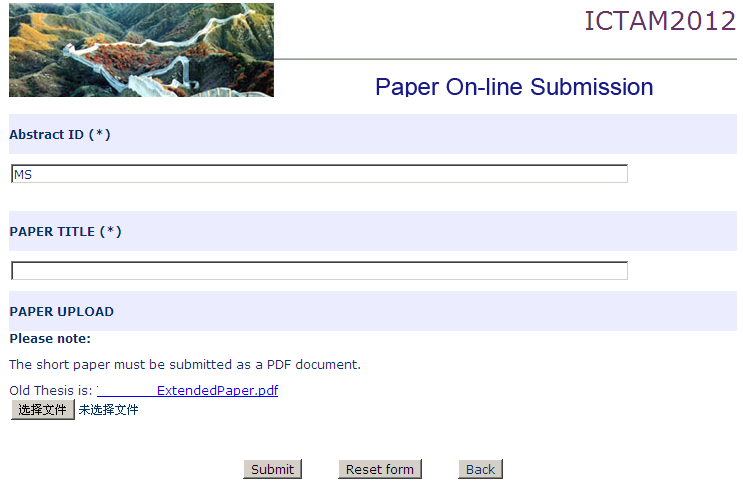 Paper online submission system was closed at 24.00 hours (Beijing time) on Thursday 19 January, 2012. But it will become available for our authors to check the status of the paper and receive the notification of acceptance from April 10, 2012. We cordially invite you to submit a paper to the ICTAM2012. The following guidelines have been prepared for authors of papers, which provide the steps for the on-line submission of the abstract and short paper (maximum 2 pages) on the Congress website. Prepare an Abstract as a text file. Prepare a Short Paper as a PDF file (Download the template: Latex or Ms-Word). 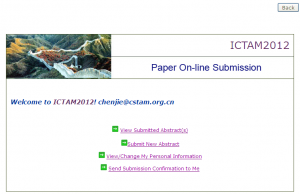 Visit the ICTAM2012 web page, register (if you have not already done so), and submit both Abstract and Short Paper following the instructions. Confirmation by way of an e-mail will be sent to your e-mail address. All contributors are requested to register themselves using the Paper On-Line Submission function on the Congress website. The contributor is requested to input a valid email address, which will be used together with a password to log in an account to submit the Abstract. If you have not registered yet, please select the button “New Register” to input your information. Upon completing the form, you will receive a confirmation email. With your Email and Password you will be able to submit abstracts for consideration for the ICTAM2012 (Just click the button “Submit New Abstract”.). The Abstract is limited to 150 words. It should not contain figures, drawings or extended references. The name of the author presenting the paper must be given. One author can only present one paper, with the exception that an author may present one paper on Education in Mechanics and another paper in one of the other sessions. The contributor can also choose whether he/she wishes to be considered for the IUTAM Bureau Prize. If you want to apply for the IUTAM Bureau Prize, please check the box “AWARDS”. The contributor can also choose the preferred presentation type (lecture/seminar presentation). Abstracts of all papers invited for presentation will be printed in the Abstracts Book. The Short Paper will be used for evaluation by International Papers Committee. It should be prepared as attractively as possible, much like a manuscript for journal submission. When the status has been changed into “Abstract received and upload your short paper now!”, you could select the button “Upload” to submit your Short Paper. A Short Paper which does not match up with the submitted Abstract in terms of title or names of authors will not be considered. The Short Paper is limited to a maximum of two A4 or 8½×11 inch pages (including figures) and it must be submitted as a PDF document. A Short Paper which is more than two pages will be returned. The text must be 10 point or larger in size. To check the status of your short paper, just click “Upload” button to see it. ﻿To replace your paper, please upload the new version of your Short Paper directly (see the picture as below).